1. Approved to IEC/ EN60950, UL60950 safety standards. 2. Industry standard footprint: 2" x 2" x0.38 " ( 50.8 x 50.8 x 9.66mm3). 4. Wide input voltage: 36 - 75V. 5. Single output: 3.3V, 5V. 7. No minimum load requirement. 1. Electrical specifications: (1) Input range: 36 - 75VDC. (2) Output voltage setpoint accuracy: ± 1.0% Vo max. (3) Voltage adjust: 90% to 110% Vo. (4) Line regulation: 0.2% Vo max. (5) Load regulation: 0.5% Vo max. (6) Ripple and noise: < 75 mVpp max. (7) Transient response: 200mV max. (8) Recovery: < 200uS max. ( 25% step load change from 50% Io). (9) DI / DT: 1A / 10uS. 2. 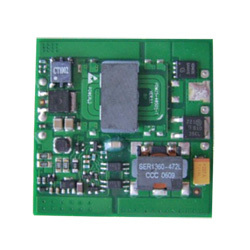 Environment: (1) Operating ambient temperature range: -40℃ to 55℃. (2) Operating case temperature range: -40℃ to 100℃. (3) Storage temperature: -55℃ to 125℃. (4) Temp. coefficient: < ± 0.02%/ ℃. (5) MTBF: > 2 million hrs. 3. Control. (1) Positive logic: High = on: 3.5 to 10 Vdc. Low = off: - 0.7 to 1.5 Vdc. (2) Negtive logic: Low = on: - 0.7 to 1.5 Vdc. High = off: 3.5 to 10 Vdc. (3) Control: 2mA max. ( for positive logic), 4mA max. ( for negative logic).